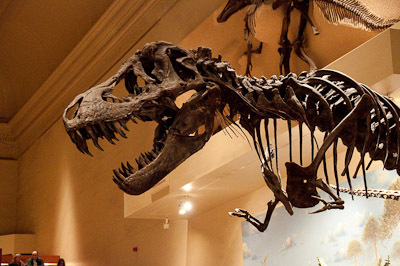 Preston, Dylan and I went to the Smithsonian National Museum of Natural History yesterday. Preston just loved the Insect Zoo. 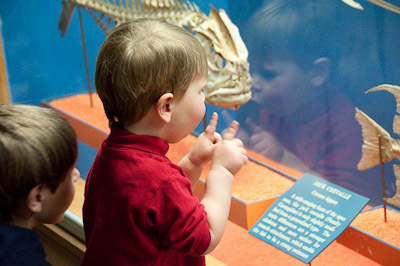 No way was Dylan going to hold a bug, but it was hard to keep Preston away. 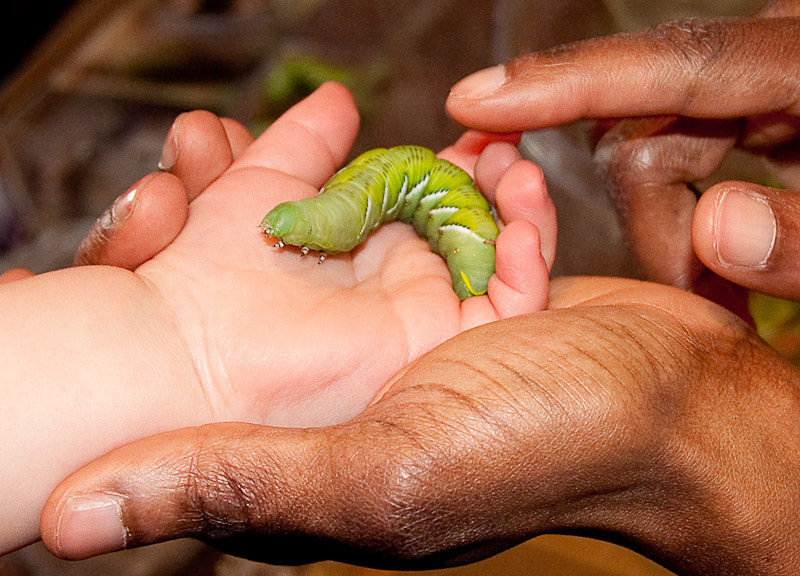 He also held a big beetle, but I couldn’t get a picture as I had to help keep Preston from squishing it. 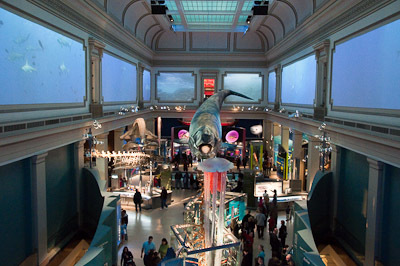 The new Ocean Hall is quite good. Even Dylan was impressed by the giant jellyfish (seen in foreground). 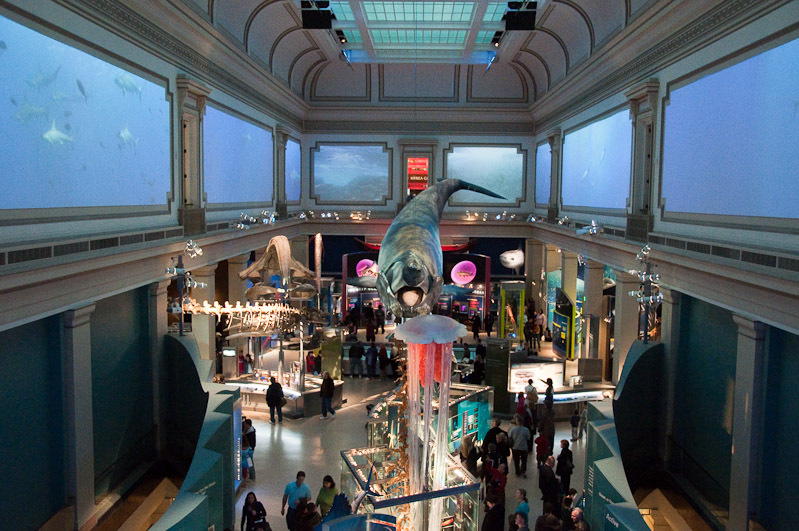 Full-size right whale hangs from the ceiling, and videos of ocean scenes line the walls. Lots of informative exhibits about the ocean. 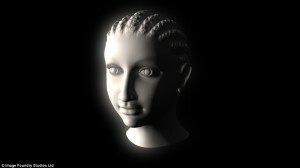 A 3-D image of Cleopatra has been rendered by computer imaging based on images from ancient artifacts. 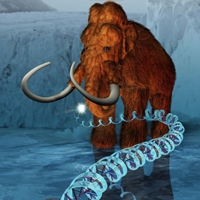 Researchers at PennState have published the DNA sequence of an extinct Woolly Mammoth; see the news article at Nature.com, or the November 20, 2008 issue of Nature for a paper by Miller, et al. 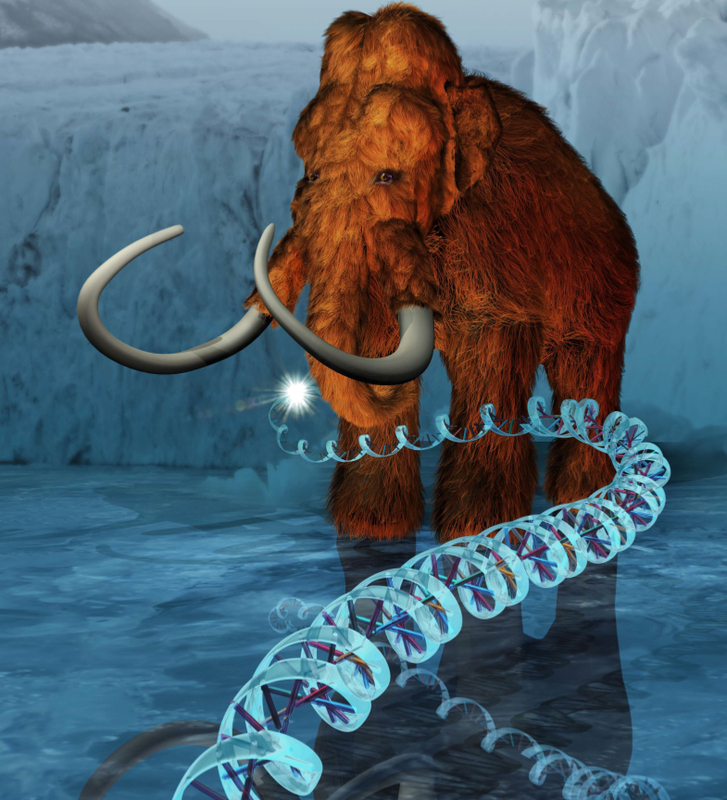 (Nature 456, 387-390: “Sequencing the nuclear genome of the extinct woolly mammoth“). 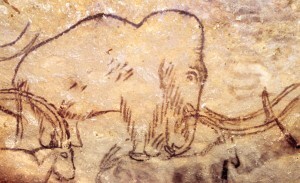 Mammoths went extinct some 10,000 years ago, but have been found preserved in Russian permafrost. 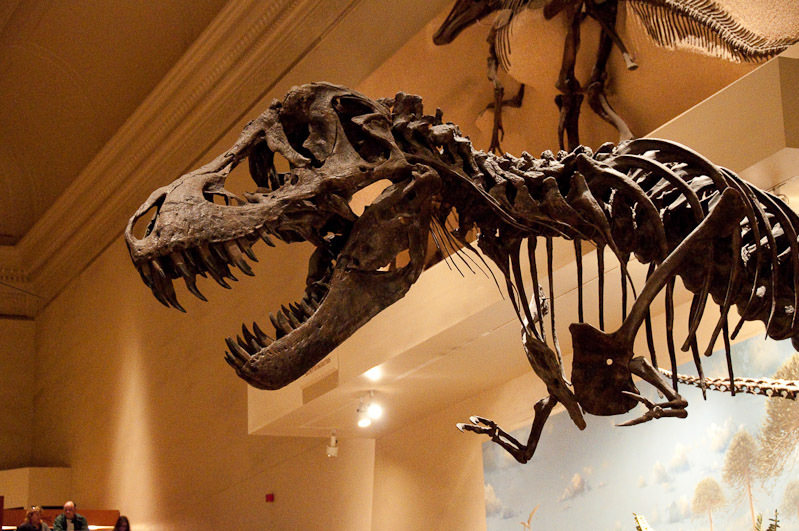 The hair from one of these preserved (mummified) ancient beasts was used to retrieve DNA. 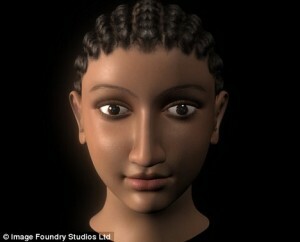 Hair is useful for such extractions as it is relatively easy to wash away contaminating (foreign) DNA. One tidbit that I found quite interesting: where did the researchers get the Mammoth hair? They bought the hair on Ebay.com! You can too, for only $175.00 for 2.5 grams. 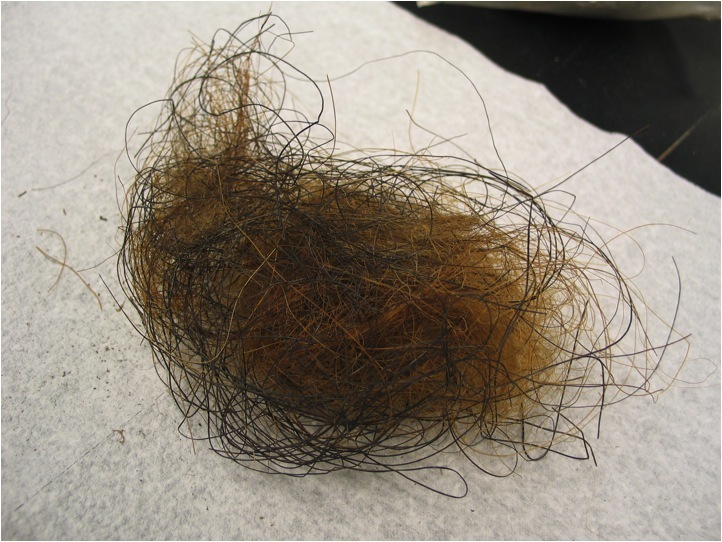 Yes, the researchers did verify that this was actual mammoth hair. Anyway, the big question is whether or not we will shortly have a Mammoth clone. Short answer: not any time soon. This is just the first step, but is a major one. 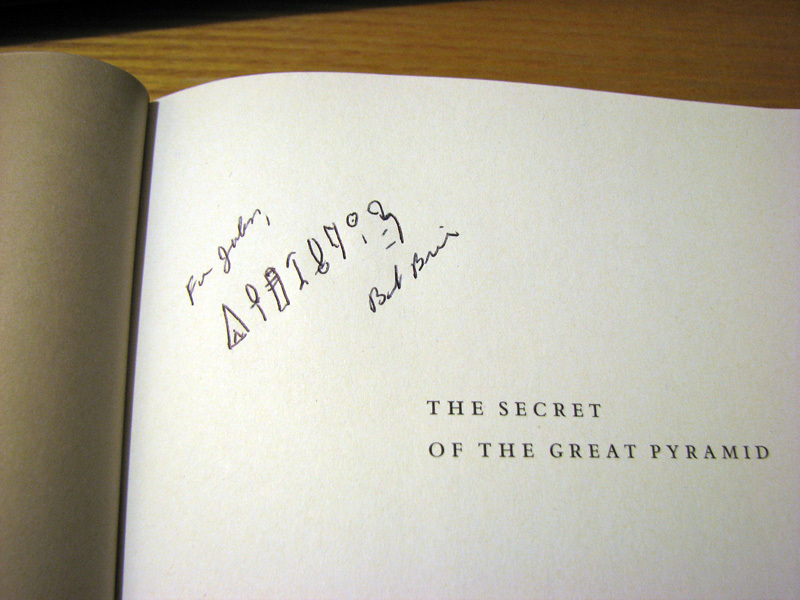 Thursday evening Dylan and I went to see Prof. Bob Brier give a talk on the Secret of Egypt’s Great Pyramid. He presented evidence that supports French architect Jean-Pierre Houdin’s theory that an *interior* ramp was built and used to raise the huge blocks to the top of the 480-ft. high Great Pyramid of Giza. 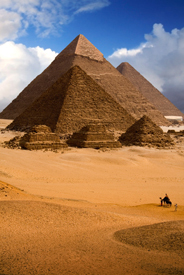 A few *million* such blocks (averaging about 2.5 tons each) were used to construct the pyramid. Fascinating talk/slide show. 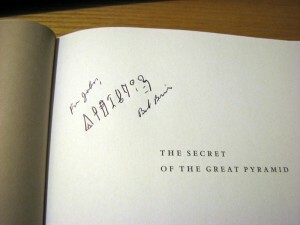 After the talk Prof. Brier was signing copies of his book, The Secret of the Great Pyramid. He inscribed my copy with the neatest inscription I have yet to get from an author. He wrote an Egyptian prayer – in hieroglyphs. It reads, “May you be given life, stability, and prosperity like Ra, forever.“. Beat that! A 5200 year-old goblet (see image below) from the Burnt City in Iran has a series of images depicting a wild goat jumping up to get leaves from a tree. The animation shown is from an 11-minute documentary about the goblet (which was actually found ~1970). 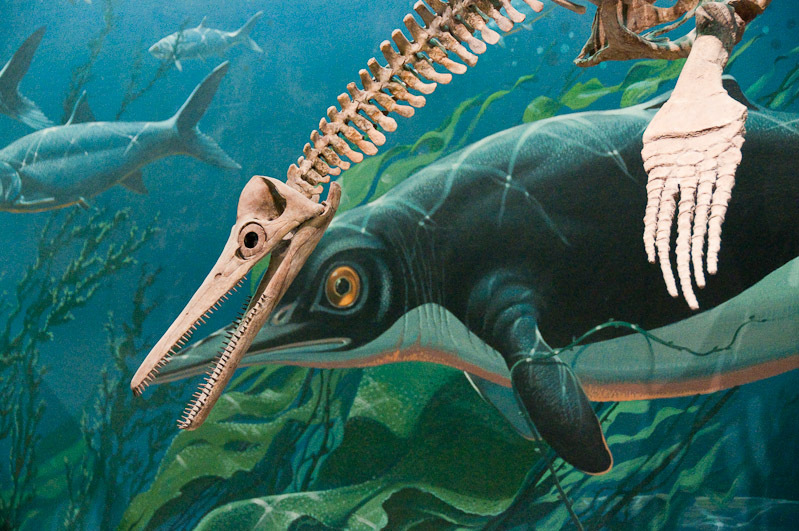 Basically, if you take each image in succession (like a flip-book), you get the animation. Neat. Note that the post-revolutionary Iranian archaeologists kinda got things wrong; they attribute the tree on the goblet to the “Assyrian Tree of Life”. But the goblet is from 1000 years before any mention of the Assyrian civilization in historical records. Ooops.